Welcome to our fourth visit to the annual Taunton Vintage Bus Day, which was filmed by the independent transport videos cameras on Sunday 14th May 2017. Filming starts at the very beginning of the day as the ‘control bus’ takes it’s position on Castle Green, which is, together with the Bus Station, the main hub for the event. The control bus is Buses of Somerset (First West of England) 38006 (D706 GHY), an open-top Alexander-bodied Volvo Citybus B10M-50, freshly repainted in the two-tone green livery of that company. We film the early arrivals that take up their positions on Castle Green and at the Bus Station. As usual a good number of bus companies are represented at this event. These include Barton, Bournemouth Corporation, the Bristol group of companies, Caerphilly Corporation, Crosville, Damory, Devon General, East Kent, Huddersfield Corporation, London Transport, Royal Blue, Scout Motor Services, Standerwick, Thames Valley, Warrington Corporation, Western National and Yelloway. Our locations are also many and varied. These include the Bus Station, Castle Green, Castle Way, Tower Street, Fore Street and Corporation Street. Apart from the preserved buses running in service we have also included the contemporary vehicles of the Buses of Somerset fleet and the National Express coaches that pass through the town. This we believe gives an interesting comparison of modern day vehicles with those of the past. The first ride out for our cameras is on board DL640 (MTT 640), an all Leyland Titan PD2, formally operated by Devon General. 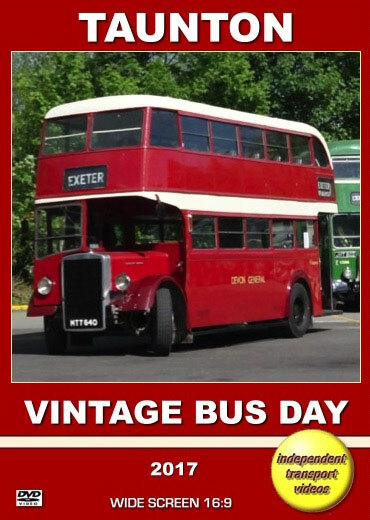 We travel in a packed lower saloon to the Buses of Somerset bus garage on Hamilton Road, Taunton. A display of current buses and coaches are parked outside for inspection by the public, enthusiasts and of course our cameras! We return to the Bus Station on board 207 (MHU 49), a Bedford OB with a Duple B29F body in the livery of Bristol Tramways. Our cameras film the ride from ‘over the shoulder’ of the driver which will give you the driver’s view of the road as well as the superb sounds of this lovely old Bedford bus. Filming continues around the Bus Station and in the town before we join 508 (THU 354G), a Bristol RESL6L with an ECW B43F body from the Bristol Omnibus fleet. The RE takes us to Bishops Lydeard railway station and back to the Bus Station. Superb sounds from the Leyland 0.680 engine and lovely views of the Somerset countryside from the windows make this journey most enjoyable, especially as we are following Bath Services Bristol Lodekka LD, L8515 (969 EHW) that compliments the scene! Now back at the Bus Station we continue to film along Castle Way and Corporation Street. Our final scenes are in the Bus Station as Buses of Somerset 38006, work completed, heads back to its garage. We hope that you have enjoyed your visit to this excellent event and running day.